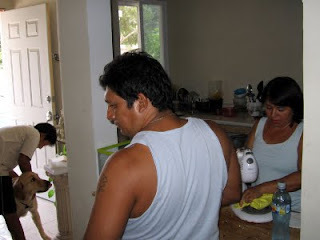 Sunday was a busy day for us here on Isla Mujeres. 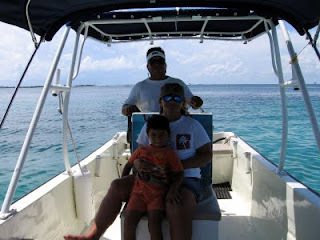 In the morning, I took a boat ride with my old friend Ariel and his family. Ariel runs a fishing, snorkeling, whale shark watching and Isla Contoy tour operation with his 27-foot panga: arielsantizo@yahoo.com.mx or 011-521-998-165-6332. 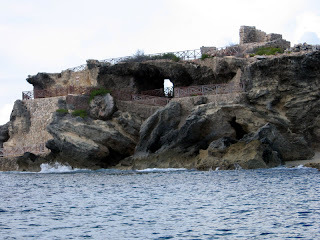 We motored all the way around the island while I took photos of familiar landmarks for the book I am working on. Nan didn't want to go so she stayed behind with Scout. It was a calm day, which made for easy photography. Ariel says that rounding Punta Sur can be terrible on days when the wind runs counter to the current. The first photo shows the Mayan ruins of the temple to Ixchel and El Arco, the arch under it, at the southernmost tip of the island. In the afternoon, we took the golf cart down to our friend Juan's new house in Colonia Salina Grande. The house is much further along than when we saw it last October (Isla Mujeres, Mexico), but it is still not finished and may never be. There are no loans to be had, so construction is a pay-as-you-go proposition, and it has been tremendously slowed by the poor economy and lack of tourism. The book I am working on now is a collaboration with Juan's wife, Paula. 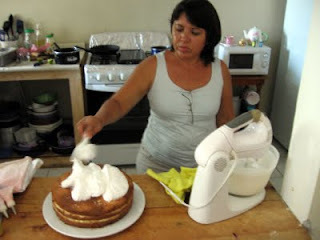 We are writing a Mexican cookbook, Los Sabores de Isla Mujeres / Tastes of Isla Mujeres, based on Paula's traditional recipes. It will be in both Spanish and English, and there will be photos of her wonderful dishes and also of the island. 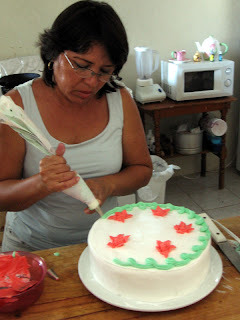 The main purpose of our Sunday visit was to photograph Paula baking a tres leches (three milks) cake. It was a three-hour affair, with time for a take-out lunch of chicken tacos and cervezas from the local tienda while the cake was in the oven. The finished cake was almost too beautiful to eat, but we all took a slice or two, and neighborhood kids came out of nowhere to help share it. There were big frosted smiles all around! We have invited Juan and his family to our apartment at Color de Verano on Friday evening for a dinner of chicken enchiladas Nan-style. We hope to keep a back-and-forth dinner exchange going for as long as we are here. Of course, we also expect to enjoy as much of Paula's fabulous cooking as we can. We'll consider it research! Nan, Scout and I arrived here safely on Saturday afternoon. The flight from Denver was bumpy and the landing a bit rough, so we were not surprised to see that Scout had puked a little when he came around on the baggage carousel at the Cancun airport. He seemed fine otherwise and was happy to get out of his crate. Clearing him in through customs and immigration was more difficult than we expected. In addition to the four different vaccinations Scout was given before we left, they were expecting to see proof of inoculation for internal and external parasites on his official Health Certificate. None of the information we had read as we prepared for our trip indicated that this was necessary. Fortunately, Nan had a copy of the receipt from our visit to the veterinarian, which showed that we had purchased flea and tick medication and heartworm pills, and they accepted that as adequate proof, but it still took more than an hour to process his entry permit. On the plus side, the officials were kind and did not charge us the normal $15 USD fee for the permit. On Sunday morning, we took a walk around the north end of the island. Scout was timid about the breaking waves, but he eventually waded in and out of the water. 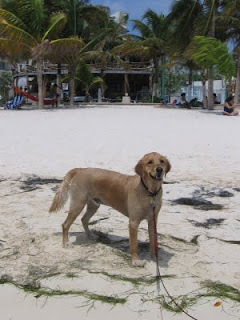 We have been keeping him on a retractable leash for safety, and this helped greatly in our encounters with the feral dog "gangs" that cruise the beaches. In the afternoon, we set up beach chairs in the shade of some palm trees on the beach across the street from our apartment. 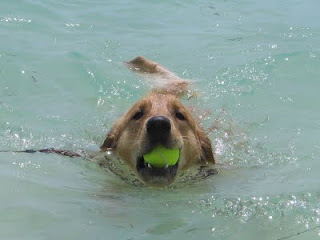 Scout quickly lost his fear of the waves as he dove over them to fetch a tennis ball I threw for him. He even swam confidently when the water was too deep for wading. Sunday is a big family day on Isla Mujeres, so there were lots of kids playing in the water. They were afraid of Scout at first since he is much larger than the native dogs, but they warmed up to him when they saw how friendly he is and how much fun it is to throw the ball for him. Scout has been a big hit everywhere we go with him. People seem pleasantly surprised to see American tourists with their dog, and they greet him warmly. Kids point and say "Perrito!" because with his short haircut, he does look like a puppy. Late in the afternoon, we rented a golf cart, one of the primary means of transportation on the island, and went to find the La Gloria school where Nan will be volunteering. Scout sat on the floorboard and watched the sights whiz by, at one point sitting on the gas pedal when I had my foot on the brake. No harm was done but we did burn a little rubber.